In recent past years, many diplomas and certifications programs were launched by the different sectors and institutions, but there were some things missed and we can say that it would not be completed so far. 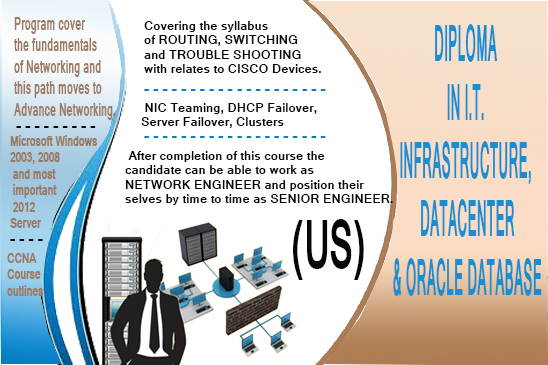 This Unique DIPLOMA IN I.T INFRASTRUCTURE WITH DATACENTER AND ORACLE DATABASE is the complete solutions or package for those candidates, who are willing and would like to develop their careers in the field of Networking or work in high tech areas of Networking. The specialty and this program cover, the Basics or fundamentals of Networking and this path moves to Advance Networking. The areas that would be covered the Microsoft Windows 2003, 2008 and most important 2012 Server Technologies with hands-on lab exercises. The special power of Windows 2012 Server and Windows 2012 Server R2 features ,where NIC Teaming, DHCP Failover, Server Failover, Clusters and etc shall be covered and participants will be eligible for the Examination of MCSA as well. Further specialty of the program that it is covering the syllabus of ROUTING, SWITCHING and TROUBLE SHOOTING with relates to CISCO Devices. 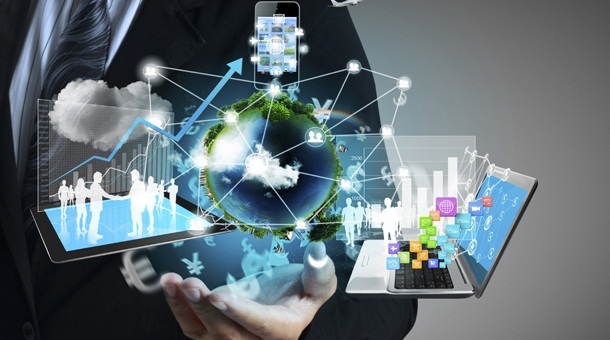 The Program also covers CCNA Course outlines with respect to CCNA Examination and due to hands-on Lab Exercises the participant fully equipped and trained to give the examination of CCNA as well. 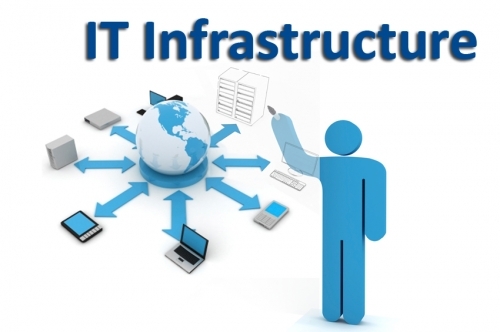 In the professional market and also the understanding of professionals, they know that all these above mentioned domains or exercises shall be implemented in good organizations or in their DATA-CENTERS. 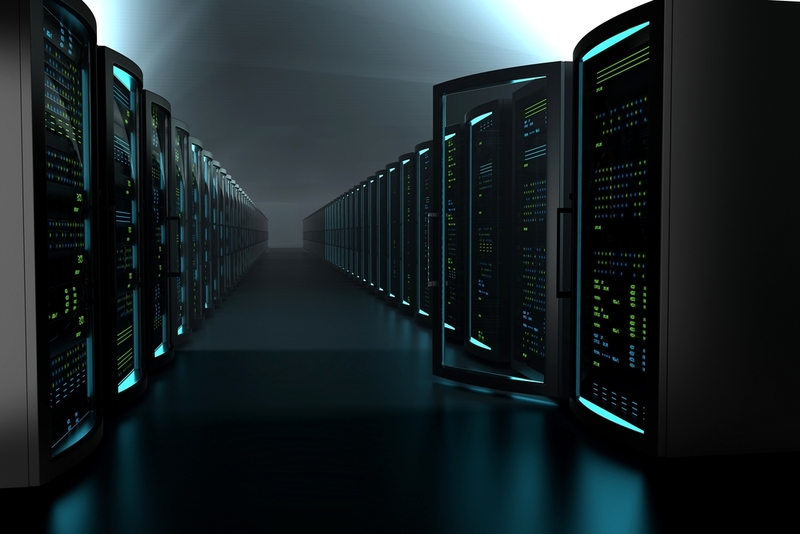 Therefore, in this course the datacenters fundamentals till intermediate levels shall be acknowledged and covered to provide the best of the best knowledge to each participant in order to provide the latest knowledge regarding datacenters works and its sensitivities. Further, the organization cannot run without having the Databases or we can the production servers. 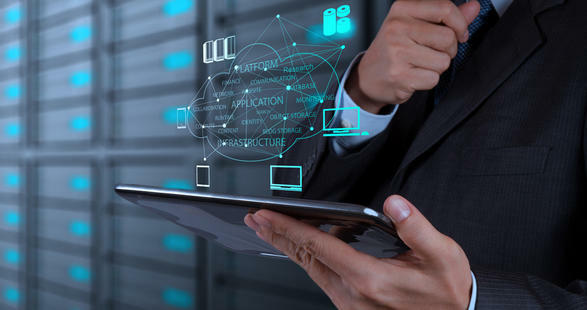 So in this course, we also entertain the ORACLE DATABASE, where it schema, installation, configuration, implementation and backups with migration techniques are encountered. After completion of this course the candidate can be able to work as NETWORK ENGINEER and position their selves by time to time as SENIOR ENGINEER. 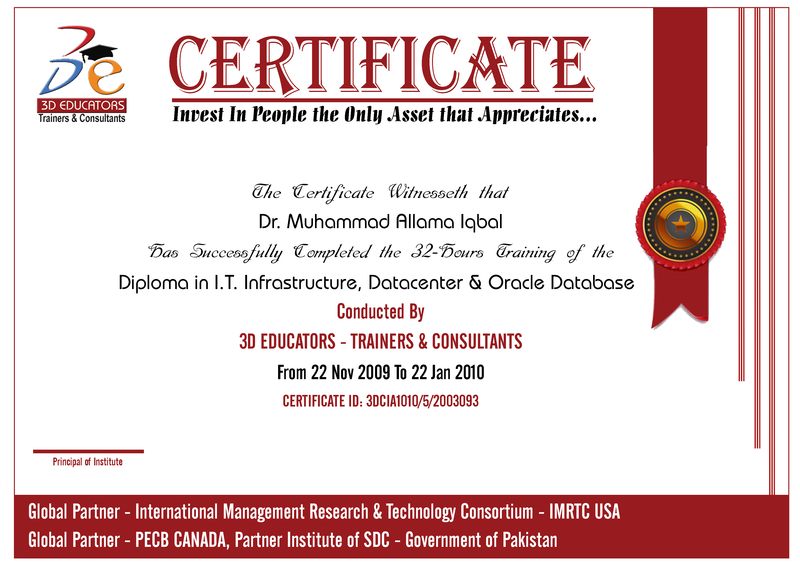 "The Pr-requisites of the course, the candidate must have Matric or Inter From any discipline. Further it is better to have a science background. " Any Networking accreditation should support and claim that an accredited person is a Quality Engineer or Manager, who has acquired skills and methodology for necessary jobs in a professional manner. Therefore, the accredited body would be any one, if the person should have the complete set of knowledge of this domain then S/he would be settle in any organization with full strength and make his own place in their respective managers or seniors.